I’m always looking for ways to get more ‘bang for my buck’ from client content marketing/link building campaigns and today I’m going to share one of my favourite tactics for doing just that – dual targeting. We’re going to create a great piece of content themed around our niche, but it is also going to be connected to another niche, allowing us to effectively double up our prospect list. And doubling up our prospect list = the potential to double up on our backlinks! What’s not to like? This works particularly well in niches where it can be a little harder to build links through outreach (i.e. not many active bloggers etc). I’ll give you a couple of hypothetical examples in a moment to show you how this works, but first let me address the elephant in the room. Don’t We Want Links From Our Own Niche? I’m certainly one who preaches the SEO value of thematically related links, but in a natural link profile you would also expect to see a proportion of links coming from outside of the niche too. Remember we are dual targeting, so we will be picking up links from sites that are in our niche as well as those in the second niche. So, onto some examples. Let’s pick a difficult niche (I like a challenge!). Actually, it sounds like a boring niche, who cares about toasters? But for me this immediately gives us loads of opportunities. Let’s map it out a bit and find our tier 1 targets (i.e. directly related to our niche). This is the only kind of tiered link building you’ll find on this site! 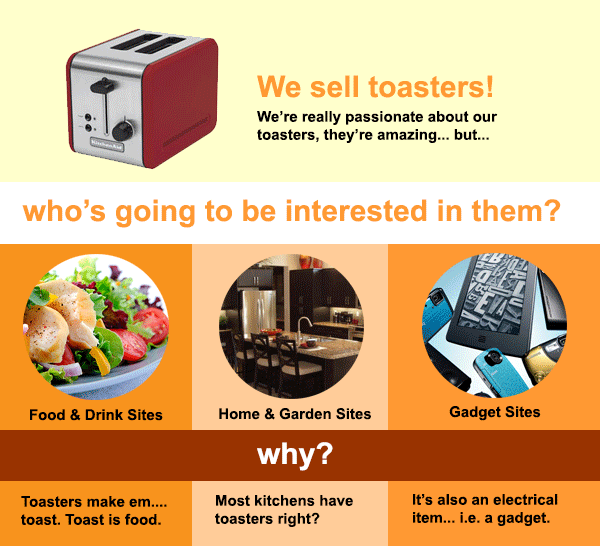 Food & Drink Sites – Toasters make em…. toast. Toast is food. Home & Garden Sites – Most kitchens have toasters right? Gadget Sites – It’s also an electrical item… i.e. a gadget. So, now we have identified 3 primary niches, let’s go ahead and dual target a piece of content for each of them! There are a couple of obvious link bait type ideas, which we could target directly at food bloggers, i.e. ‘10 Meals You Wouldn’t Believe You Could Make In A Toaster‘. Does Toast Really Always Land Butter Side Down? We’re going to actually make this a proper study and target not just the food & drink sites, but also science blogs. To make it interesting how about a video showing us dropping toast from various heights, or famous landmarks. To interest the science blogs we’d need to put a fair bit of effort into it, working out for example if the height of the ‘dropper’ made a difference, the amount of butter, maybe toast with jam/peanut butter etc. Hopefully you get the idea! We could then tie all the results into a nice infographic and use Brian Dean’s guestographic method to prospect for links. Another idea would be an article on low carb alternatives to toast, which we could dual target to both food blogs & diet blogs. Again, massive outreach opportunity there! Technically we could quadruple prospect this one at our gadget sites too, but let’s get a more specific example for that sector. 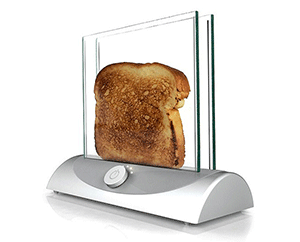 So, for gadget sites the obvious thing would be to go for technologically advanced toasters (this transparent toaster is pretty cool!). But how could we dual target that to get the most out of our link building efforts? Well, for this one we could actually steal a lead from elsewhere – one of my favourite viral marketing campaigns of recent times; Blendtec’s Will It Blend? It’s obviously got huge viral potential, so if done right would probably pick up links all over the place without us having to even do much outreach! Here’s the Blendtec slicing up an iPhone 5S! No Limits To White Hat Link Building With Dual Targeting! So, we’ve taken what seems like a pretty boring product niche and have 4 interesting content ideas that can be targeted at 8 different niches. It’s taken me about 2 hours since deciding on a niche for this article to come up with those ideas and write it all up, so just imagine the number of possibilities you can come up with for your own site. White hat link building is all about getting creative with your content and then targeting it to your link prospects – the only limit is your imagination. And believe me, it works! These are the links that will push your organic search traffic through the roof and mean you never have to worry about google algorithm updates or penalties taking away that traffic you’ve worked so hard to build up. Dual targeting (or more) your content opens up so many opportunities that there really is no reason to have to even consider automating your link building. So don’t! 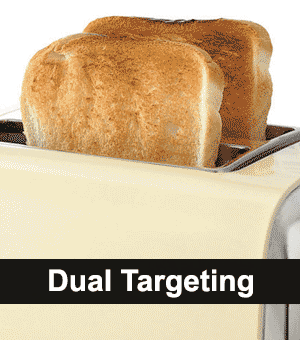 Have you used dual targeting in your own link building campaigns? Are you going to try it out? Any questions? Do you have any more created ideas for toaster related articles!? What did you think of my ideas? Drop a comment below and let me know! Good post. You also need a brave client that wants to run with these types of ideas, sometimes that’s not always easy. Smaller companies sometimes like to play it safe when they should really be singing and dancing and doing remarkable things to stand out, get attention and attract natural links. A lot of the larger corporate clients I’ve worked with in the past have really narrow visions of their “market” so I’d have a hard job selling it to them. I actually think it would work best for smaller companies/sites that need to increase brand awareness and build links quicker than more established companies do. Often the bigger the car, the slower the wheels turn unfortunately. The good thing is it does give an opportunity for smaller companies who think big, to compete with the bigger guys. I was in the theatre (watching my daughter perform) when I received your ‘tweet’ last night and after getting the usual Monday morning chores out of the way I managed to digest (no pun to toast) your post this afternoon! Thanks David, great post as ever! That’s it exactly Andy – gives you a lot more scope for outreach. Keep me updated! What a simple, yet effective, idea. I’ll be trying it out in one of my niches shortly. Thanks dave, best of luck! Great post indeed. It will definitely help boost your brand, specially for small businesses.